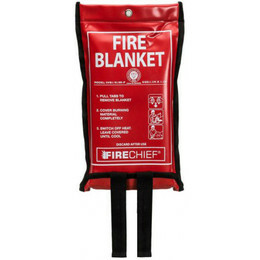 This Firechief 'Soft case' blanket makes for a very straightforward and simple fire blanket design. The blanket is held in by a Velcro strap which releases when the blanket is pulled meaning it is very reliable and easy to operate. These soft packs contain the K100 cloth which is a coated glasscloth in a twill weave. Economy soft case fire blanket. Available in 4 diffeent sizes. Screen printed soft PVC pack.